the meeting is still on. Link’s to each club website are provided. The Dirt Track Riders Association promote the Flat Track Nationals at the MCN Live Festival at the East of England Showground in Peterborough. The Dirt Track Riders Association promote the Flat Track Nationals at the Greenfield Dirt Track in Lincolnshire. This round uses the TT course. The Dirt Track Riders Association promote the Flat Track Nationals at the 1/2 mile course at the Ammanford Trotting Track in Wales. DirtQuake 2019 will take place on the 9-10 August at Arlington Stadium in Eastbourne, Sussex. 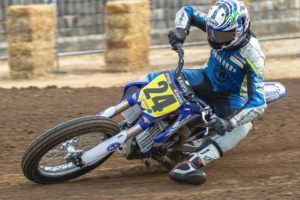 DirtQuake is a motorbike festival centred around "Run what you Brung" flat track racing for allcomers. They want to see your personalities, alter egos and passion for the sport we all love! Tickets will go on sale very soon and Rider Registration will open shortly. Keep an eye on their social media (@DirtquakeUK on Facebook and Twitter, and @Dirtquake on Instagram) for when they go live and visit https://dirtquake.com/ for more info. The Dirt Track Riders Association promote the Flat Track Nationals at the Greenfield Dirt Track in Lincolnshire. Dirt Diggers 2 is go!